LISTENING NOTES: The Latin Goes American: "Pops and Prado"
The Latin Goes American: "Pops and Prado"
This record, released in 1959, bears the subtitle "The Latin Goes American", and the cover photo gives the impression that RCA was attempting to tap into the growing teen market. What could have been a disaster turns out to be one of the greatest Prado albums ever! As the liner notes state "In this collection, "The Latin Goes American"...with no sacrifice of the essentials that have made him one of the greats of popular music. Mostly the beat here is not quite the mambo, and neither is it the cha-cha. 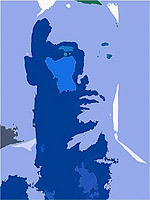 Here the rhythm is definitely Latin American, but with a touch of what today's hip set would term the right beat". Prado has given his sound an update with the addition of the Hammond electric organ, in addition to the usual piano, bass, percussion, two drummers, one trombonist, four reeds and five superb trumpets. Believe me, the effect is dazzling! Unlikely standards such as "Carolina In The Morning", "Taking A Chance On Love", and "Heigh-Ho" (yes, the dwarves marching song) are transformed into danceable (and listenable) gems. Oh, and Prado's signature shouted "Ughh" is heard throughout! The session was recorded in the superb acoustics of Webster Hall in New York City, by Bob Simpson, who engineered many audiophile classics, most notably "Belafonte at Carnegie Hall", for which he won a Grammy Award for Best Engineering. Sound quality is exceptional, as you would expect from a release bearing the Living Stereo banner, particularly those from 1958 and 1959. The copy under review is a coveted Black Dog Living Stereo label original pressing from RCA's Indianapolis plant, with 1S/1S stampers. It doesn't get any better - this is the earliest of the first pressing and the sound is sensational! It is amazing that RCA was able to maintain such high standards through most of the Living Stereo era, and much of the credit must go to people like Bob Simpson, Lewis Layton, and others whose taste and skill defined the Living Stereo sound. 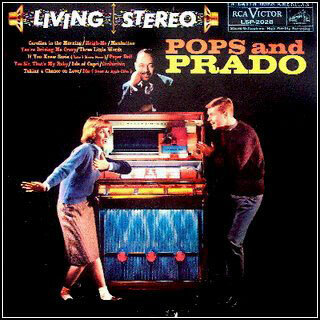 "Pops and Prado" is an essential album for Prado fans, audiophiles, and collectors of the Living Stereo records. Top recommendation!